The Eee Pad Transformer officially hit the market around the world late last month. We mentioned then that there were not many of the tablets in stock, especially in the US, with the launch mainly focusing on Europe. The available units were sold quickly at most of the retailers in the US, and many people were probably wondering exactly why the supply of the tablet was so low. Some may have figured that Asus was just taking it slow with their tablet to see what the demand was and perhaps to keep the demand for the tablet up. Apparently, that isn’t the case. Netbooknews cites sources that claim that Asus is facing massive shortages of required hardware to build the Transformer and that shortage is only allowing the tablet to be built in very small quantities. Exactly what component is so limited is unknown at this point. However, it appears that it’s not a matter of the parts simply going to other companies, but rather the parts simply aren’t available at any price. The limitations placed on Asus by parts shortages are reportedly limiting Asus to making a mere 10,000 Transformer tablets each month. 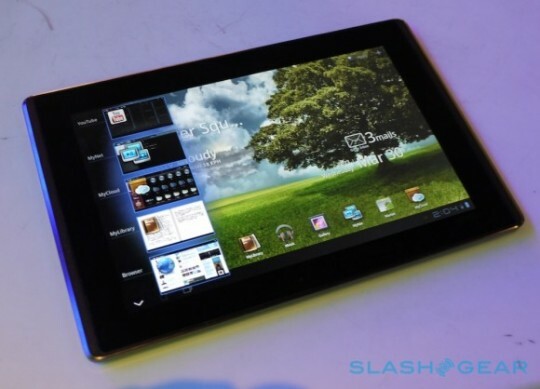 Asus would like to be making 300,000 tablets per month. The sources claim that the bottlenecks are expected to last until mid-June. I don’t think it would surprise anyone to find out that ht shortages are due to the disaster in Japan. If you want a Transformer, buy it while you can, when you can. I expect prices of the available units might push up if demand remains high. Next articleWireless Tether no longer available for Android users?